What to do when the dog sitter arrives at your home? If you choose dog sitting in your home, we recommend that you get everything ready for your dog sitter well ahead of time and prepare a detailed list of your dogs needs. This way you'll know what to do when the dogsitter arrives at your home. 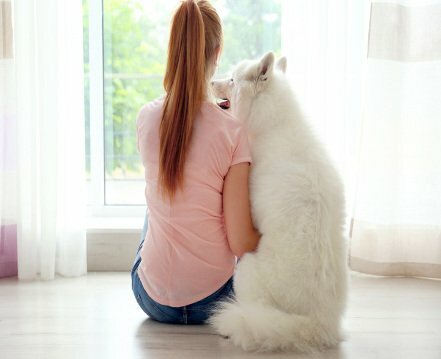 What you need to think about if you choose dog sitting in your home? When you choose dog sitting in your home it’s important to think about what you need to tell the dog sitter so that all goes well. For example we suggest you make a list of everything the sitter needs to do to look after your pet while you’re away. So if you go for dog sitting in your home it’s vital to make sure the dog sitter has all the information they need to ensure that all goes well. Make sure the dog sitter knows where to find your dog’s vet details (in case needed) as well as his/her food. And regarding food it’s important to specify the daily quantities. For dog sitting in your home, the sitter will of course take your dog out several times a day for walks and for his/her toilet needs. So as not to upset your dog’s routine don’t hesitate to let your sitter know at what times you generally walk your dog. If your dog is currently receiving medical treatment or suffers from health problems, it’s really important that the sitter is aware of this to avoid any problems while you’re away. If the sitter needs to administer any medicines make sure you show them how to do this before you leave. How to set up dog sitting in your home? As the sitting is taking place in your home, naturally the sitter will be staying there for the entire time you’re away. It’s important to remember that the sitter’s main purpose is to look after your pet. Like most pet owners, it’s completely normal to worry about what might happen during your absence: is everything going OK for the pet sitter? How are they managing their meals? Do I need to organize anything for the sitter? To clarify the situation, the sitter is responsible for their meals, journey to work and outside activities. Moreover the sitter is not allowed to have guests in your home with your authorisation. You’re going on holiday or on a trip for several days and you need to someone to carry out daily tasks in your home. So the sitter is within his rights to refuse to do any of the above. You can of course make a specific request for certain tasks and it’s up to the sitter whether or not they agree to carry them out. However, although the sitter is not required to do housework, they are obliged to leave your home in the state in which they found it i.e. to clean up after themselves.